Some percusive tones and a click effect that can be added to the traditional voices on the upper-manual. A rather awful attempt at vibrato (Hammonds are the only organs I've heard that have a nice sounding vibrato). Four upper-manual preset organ registrations (white buttons). The end of the user-programmable registration memories (green buttons). 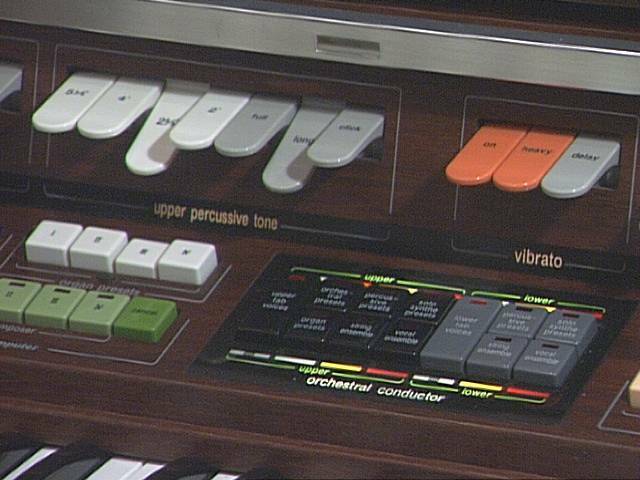 And the “orchestral conductor” which is a central point to control what tone generators are used on each manual (traditional organ voices, synthesiers, percussive instruments, etc. ).